The 24.7 metre motor yacht Elmiran, listed for sale by Steve Carlson at Denison Yachting, has been sold in an in-house deal with David Johnson introducing the buyer. 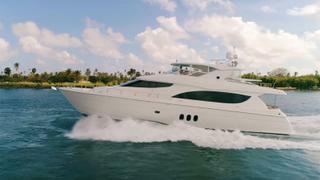 Built in GRP by US yard Hatteras, she was delivered in 2013 as a Hatteras 80 model. The interior features satin-finished cherry wood joinery, granite counter tops, custom furniture, designer fabrics and rich leathers. Accommodation is for eight guests in four cabins consisting of a master suite with a king-sized bed, two doubles with queen sized beds and a twin cabin, all with entertainment centres, LED television screens and en-suite bathroom facilities. The large aft deck is designed for al fresco dining, with a curved settee, dining table, chairs and a wet bar and fridge. The saloon comes with a sunken bar, leather club chairs and sofas plus a full entertainment system including a 40-inch LED flatscreen television. Forward is a formal dining area with seating for eight guests. The flybridge is perfect for entertaining in all weather conditions with air conditioning and heating, and includes generous seating, a full bar, electric grill, fridge and a Jacuzzi spa tub. Twin 1,600hp Caterpillar engines allow a cruising speed of 18 knots topping out at 22 knots and she is fitted with zero speed stabilisers.